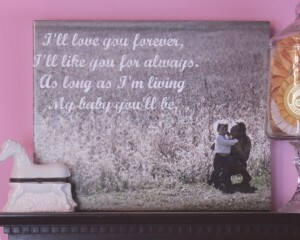 If there are two things I love it is family photos and wall words. Filling our home with cherished photos and words that inspire makes me just plain happy. I found a great deal on a faux photo canvas and did some photo editing to combine two of my very favorite things. A little canvas for my daughter’s room that makes a big impact. There is something about mothers and daughters that just cannot be explained. A special bond that cannot be touched by anyone or anything. When we did a family photo shoot last fall my friend snapped this candid shot of me consoling my two year old daughter who had had enough picture taking. The photo speaks volumes to me, and I hope it does to her as well as she gets a little older. I got an e-mail one day about a promotional offer from Walmart’s photo center. They were offering $10 off a 11 x 14 or 12 x 12 faux canvas print. These faux canvases are only $20, so the total price ended up at just $10. You can view and print the coupon here. Make sure you are looking at the faux canvas and not the regular canvas. I think &10 is a pretty decent price, considering a DIY canvas would cost you almost that much for supplies and a photo enlargement that size. The faux canvas comes on a cardboard frame and is not made with wood or regular canvas material. Make sure you don’t expect to pay only ten dollars and get a huge fancy full blown regular canvas. I love 3D canvas look of this in her room and the quality is pretty good for the price. I purchased the 11 X 14 canvas and was happy with the product I received. I did some photo editing using Picknic and made some magic using a simple and sweet photo. I first added a black vignette around the sides of the picture and edited the colors of my photo. Then I used the fancy focus tool to make my daughter and I in focus, and the rest of the photo slightly out of focus and a little softer. I left the photo in it’s original size so that it would fit my canvas properly. You have to remember that the sides of your photo get wrapped around the canvas frame, and will not be seen from the front view. I added a quote that I love, and hopefully will remind my daughter daily of how I feel about her. I have to admit, when I picked this up and looked at it for the first time, I had tears in my eyes. I guess the combination of the photo , and the quote where just right to pull on the heart strings a little. Nothing quite compares to that feeling that you get when you think about your kiddos and how quickly they will grow up and carry on with their lives, without needing you to hold their hands. Anyway, I wanted to share this coupon with you in case you want to try a faux canvas of your own. I have ordered three more since after the lady in the photo department gave me a handful of the same coupon. I’m sure if you ask they would give you some too. I have a cool project in the works that I will share with you as soon as I finish it! Thx for the review – I’m actually thinking of buying one but can you tell me if this faux canvas would be suitable to use an ink pad on it? As in, would the ink stick & dry ok on it? My plan is to print a bare tree on the canvas and then use an ink pad to create & stamp the “leaves” with each family member’s finger prints. Sorta a modern day family tree. I can’t tell from viewing the image online if this would work & the ink would stick. Since you own one, maybe you could help me figure it out? Thanks!! It would be awesome to score this using their current coupon!